The term “flowers of Edo” (Edo no hana) can refer, among other things, to fires. 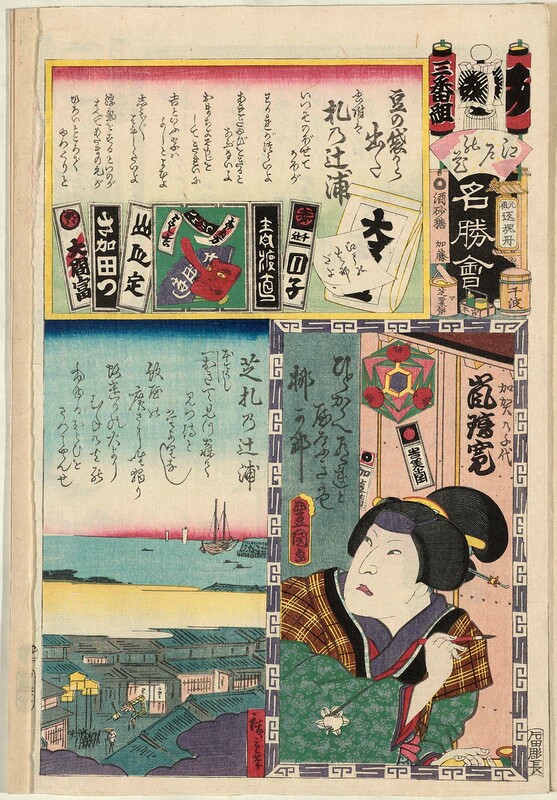 The title panel for each print in this series shows the lanterns and identifying standard (matoi) for one of the brigades of firefighters (hikeshi) assigned to various districts. On the west side of the Sumida River were 48 brigades named for the symbols of the kana syllabary and grouped into 8 numbered groups (1 to 10, minus the bad-luck numbers 4 and 7). On the east side of the river, brigades were numbered and assigned to directional groups. Outlying districts were covered by special brigades, here designated “extra” (bangai). Each title gives the name or number of a brigade, its group, and its district, followed by the kabuki scene chosen to match it.